Melicoccus bijugatus, commonly called Spanish lime, genip, guinep, genipe, ginepa, kenèp, quenepa, quenepe, quenette, chenet, canepa, mamón, limoncillo, skinip, kinnip, huaya, or mamoncillo, is a fruit-bearing tree in the soapberry family Sapindaceae, native or naturalized across the New World tropics including South and Central America, and parts of the Caribbean. Phylogeny of Melicoccus based on morphological traits, showing the placement of M. bijugatus. The specific epithet bijugatus refers to the bijugate leaves, leaves which consist of two pairs of leaflets. 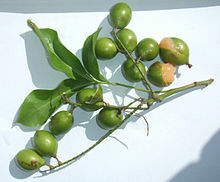 It is known by many names around the growth region: mamoncillo or mamón (in Cuba, Costa Rica, Honduras, Colombia, El Salvador, Nicaragua, Panama, and Venezuela), chenette (in Trinidad and Tobago), quenette (in the French speaking islands of the Caribbean including; Guadeloupe, Marie-Galante and Martinique), gnep or ginep (in the United States Virgin Islands, Jamaica, the Cayman Islands, Antigua and Barbuda), guaya, quenepa (in Mexico and Puerto Rico), skinnip (in St. Kitts), skinup in (Grenada), kenip (in Dominica), canepa, genip, guinep, ginepa, ginnip, kinnip, kenèp (in Guyana, Haiti, Belize, Bahamas, Anguilla, Jamaica, Sint Maarten / Saint Martin, Sint Eustatius, Saba) and in some parts of Central America talpa jocote (in some parts of Guatemala), genepa, xenepa, kenepa (in Curaçao and Aruba), knippa (in Suriname) and Spanish lime (in the United States), and limoncillo (in the Dominican Republic). Also, it is often referred to as anoncillo in central Cuba and southern Florida. It is called "ackee" in the countries of Barbados, St. Lucia, and St. Vincent and the Grenadines, however, in the rest of the Caribbean, the latter name is used to refer to the related Blighia sapida. ((Batanes, Philippines)), Chayi. Melicoccus bijugatus is native to northern South America and naturalised in coastal and dry forest in Central America, the Caribbean and parts of the Old World tropics. It is believed to have been introduced into the Caribbean in pre-Columbian times and is also found in India. This fruit, known as quenepa in Puerto Rico, grows particularly abundantly in the municipality of Ponce, and there is a yearly celebration in that municipality known as Festival Nacional de la Quenepa (National Genip Fruit Festival). The fruit ripens during the warm summer months. Trees can reach heights of up to 25 m (82 ft) and come with alternate, compound leaves. The leaves have four elliptic leaflets which are 5–12.5 cm (2.0–4.9 in) long and 2.5–5 cm (0.98–1.97 in) wide. They are typically dioecious plants, however polygamous trees occur from time to time. Flowers have four petals and eight stamens and produce void, green drupes which are 2.5–4 cm (0.98–1.57 in) long and 2 cm (0.79 in) wide. Their pulp is orange, salmon or yellowish in color with a somewhat juicy and pasty texture. The species is also commonly planted along roadsides as an ornamental tree. ^ Janick, Jules; Paull, Robert E., eds. (2008). "The Encyclopedia of Fruit and Nuts". p. 808. Retrieved 13 July 2015. ^ Duarte, Odilo; Paull, Robert E. (2015). "Exotic Fruits and Nuts of the New World". ISBN 9781780645056. Retrieved 13 July 2015. ^ a b c d e f Acevedo-Rodríguez, Pedro (2003). "Melicocceae (Sapindaceae): Melicoccus and Talisia". Flora Neotropica. 87: 1–178. JSTOR 4393917. ^ Francis, John K. Melicoccus bijugatus Jacq. Quenepa. Sapindaceae. Soapberry family (PDF). USDA Forest Service, Southern Forest Experiment Station, Institute of Tropical Forestry SO-ITF-SM; 48. ^ Entre mañas e infortunios para un dulce desenlace. Daileen Joan Rodríguez. La Perla del Sur. Ponce, Puerto Rico. Year 35, Issue 1755. Page 11. 19–25 July 2017. Accessed 21 July 2017. ^ Rinden homenaje a la quenepa en Mercado Urbano de Ponce: La quenepa, un popular fruto de la Región Sur, será la protagonista en esta edición. La Perla del Sur. Ponce, Puerto Rico. (Digital edition only) 21 July 2017. Accessed 21 July 2017. Wikimedia Commons has media related to Melicoccus bijugatus.